-If a school bus is stopped with the arm out and/or flashing lights- STOP. Wait until all children are safely on the side of the road and the bus has continued on before continuing on your way. -Motorists should stop AT LEAST 10 feet away from a school bus when stopped. Some states have laws on how far back you must be. Contact local authorities to find out the laws in your area. -If you are driving NEXT to a school bus, you are still required to STOP when they do! -Do not text and drive. PERIOD. -If it is dark, foggy or weather conditions make it hard to see, drive a little bit slower, with headlights on. Specially during the hours children are getting picked up or dropped off. -Most states have penalties and fines for failure to follow directions in regards to school buses. But why should we just drive safe around school buses? Shouldn't we be off our phones and alert all the time when driving? -Parents should talk with their children on the safety of standing at a school bus or walking to a school bus/school. -Children should be taught by parents, teachers and adults to stay out of the street. Remind them if you see them rough-housing at a bus stop. -Parents should stay off phones and keep an eye on all children at the bus-stop. Consider doing a rideshare with some of the other families or taking turns waiting at the bus stop. -If you drive to the bus stop, keep headlights on and blinkers/flashers going while parked to alert other drivers to SLOW DOWN. -If you see someone run the bus safety arm - get the license plate and call 911 ASAP with your reporting's. -If you are backing out of your driveway, always check around you for kids crossing behind your vehicle. -Children who are running late may be running to the bus stop - keep an eye out for darting children. -If there are not safe sidewalks to walk, consider talking to your local council about what you can do to make sure your children are getting to and from school safely. 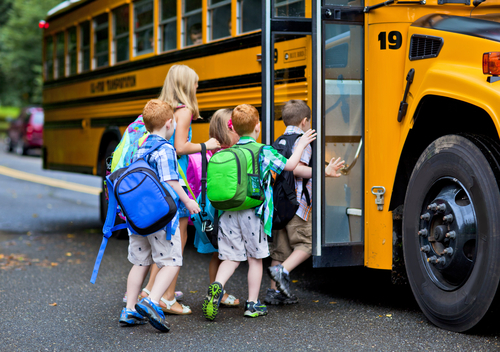 -Children should be at designated bus stops by the time they need to. Not on private property, in the street or hiding. -Make sure to teach children to look both ways before crossing a street. -Also, try talking to the school transportation department about bus drivers parking diagonally in the street (when available) to stop traffic while loading and unloading children. Please be extra safe while driving around school buses, nobody should loose a child to someone not paying attention!